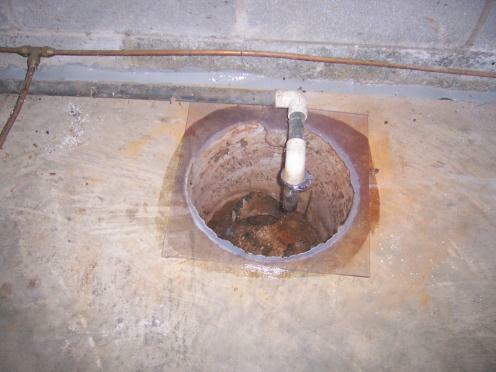 In a sub slab depressurization system the mitigator starts by drilling a hole through the floor slab. This hole is usually about 5 inches in diameter. 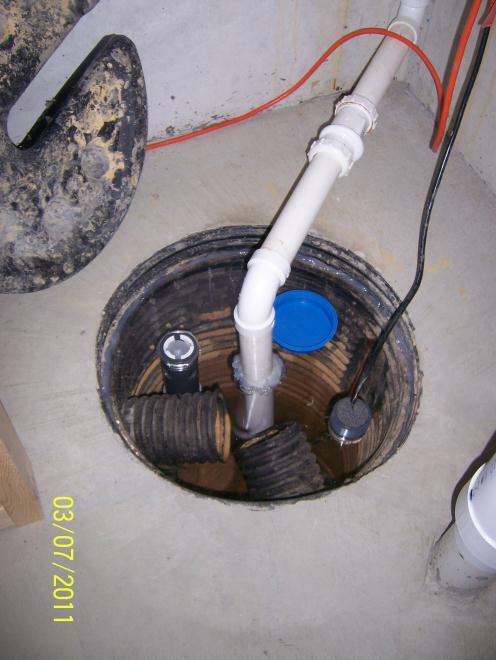 Once the hole is drilled the mitigator will remove typically 5 gallons of dirt under and around the hole. Most mitigators attempt to tie into any sort of perimeter drain pipe that may exist in the home. 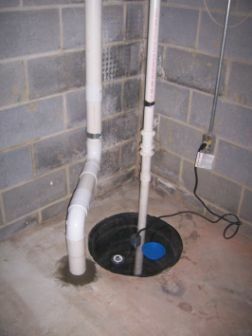 This allows for good suction across the entire basement, and by doing so typically results in only one suction hole or penetration through the floor. 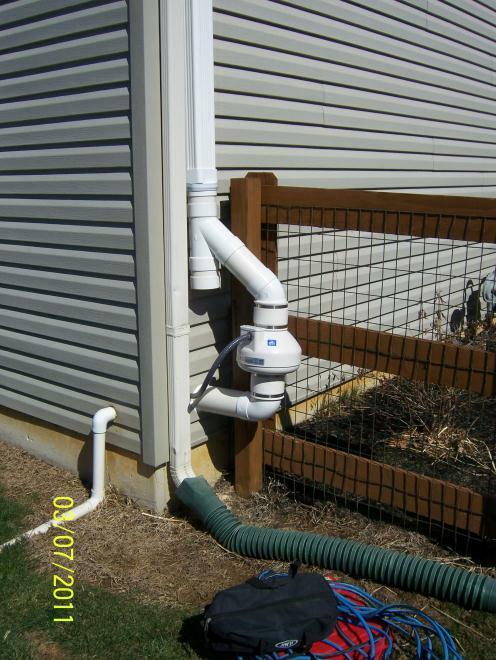 If there is no perimeter pipe to tie into some systems may require more than one suction hole. 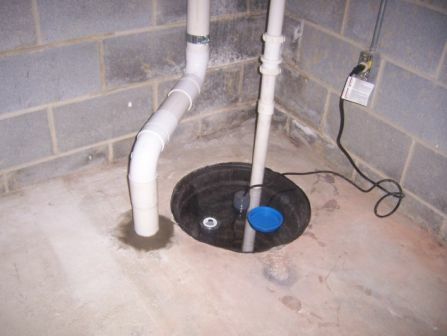 The most common method of mitigating a home is using a system called a sub-slab depressurization system. 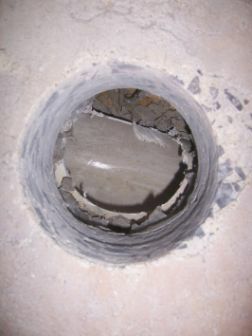 This is typically done by drilling a hole through the floor of the basement where a pipe is inserted. 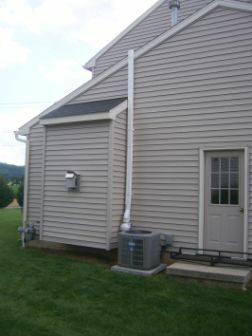 From there the pipe can either run to the outside or to the attic where a fan is attached. 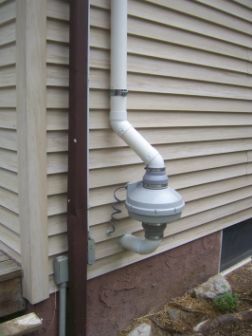 From the fan, the pipe continues above the roof line venting the radon gas into the air where it dissipates into acceptable levels. 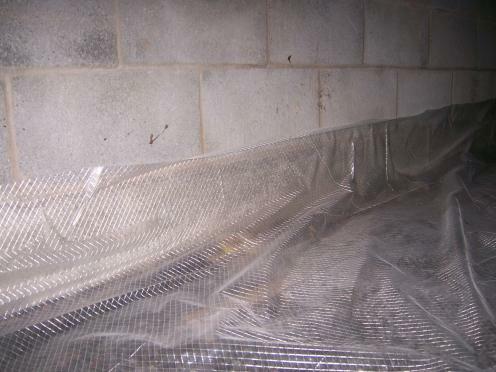 The basic concept behind a sub-slab depressurization system is to create a negative pressure under the floor slab of the basement. 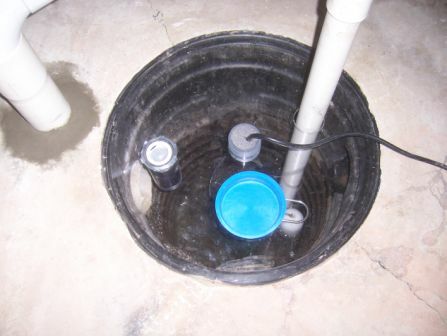 Many homes contain sump pumps or sump pits. 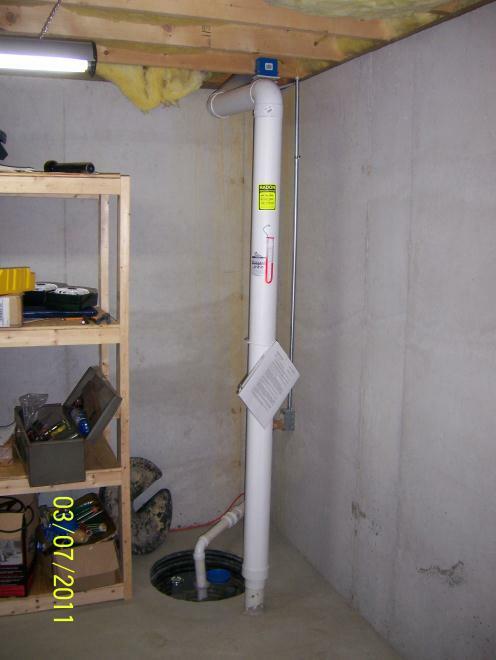 These are very large sources of radon due to a large opening in the floor of the basement. For this reason it is crucial for a mitigator to seal the pit. For an upgrade we can install a clear lid to allow the home owner a view of the pit to see any potential problems. 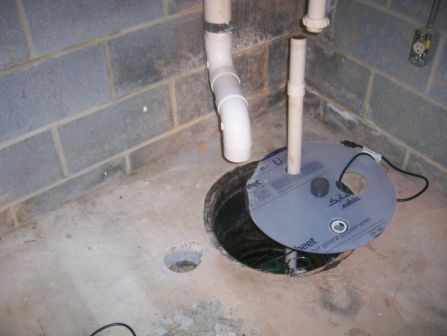 If there is no floor drain in the basement, the mitigator is required to add a drain into the lid of the sump. Many mitigators do not install these drains. These drains are designed to allow water to drain but not allow air to leave. 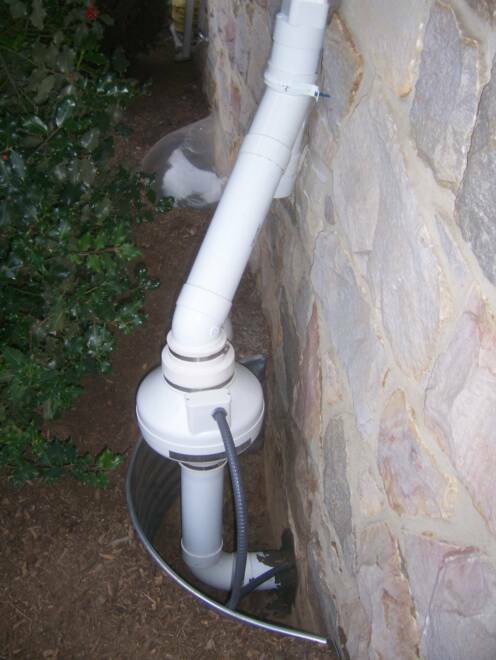 An air tight access port is also installed to allow for future maintenance without breaking the air tight seal on the perimeter. 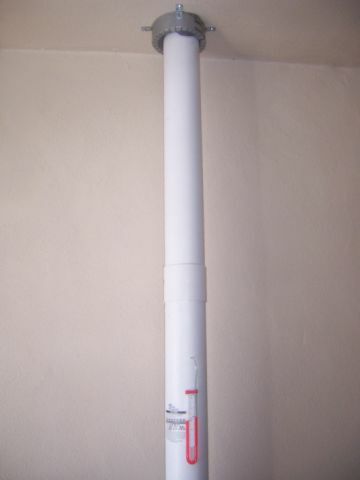 The piping is then routed through the basement where it typically exits through an exterior wall. 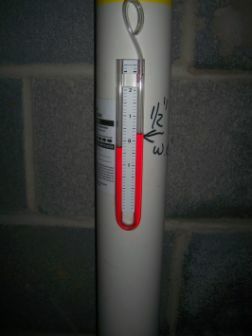 On this routing it is very common to see a pressure gage called a manometer. This tube has a fluid inside which reads the amount of air pressure inside the pipe. The mitigator will mark the height at which the fluid was at the completion of the mitigation system. 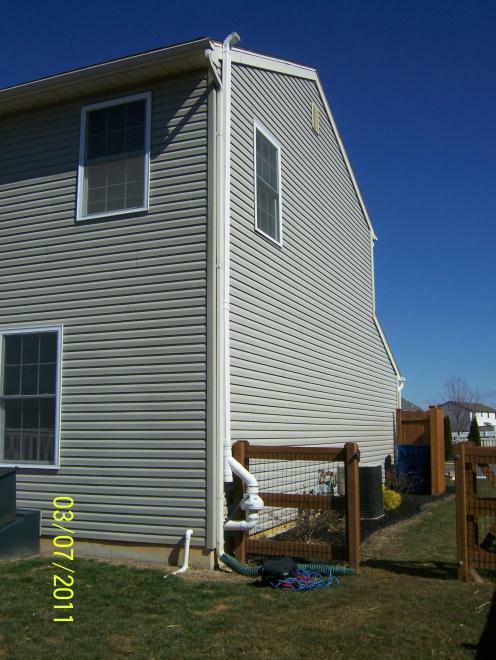 If the water columns ever read the same height this indicates a problem with the system (most typically a fan failure) and the homeowner should call for assistance. Once the piping is outside a fan is then attached. There is no maintenance required on the fan (or the entire system). 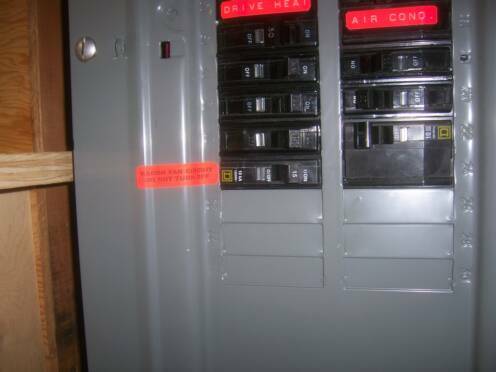 The fan should be running 24/7 and if ever stopped the homeowner should first check the electrical switch and the breaker in the electric panel. 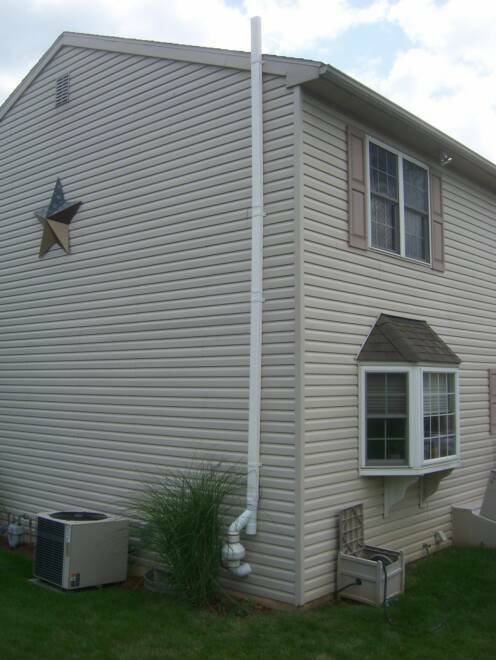 If both are on, the homeowner should call for assistance. 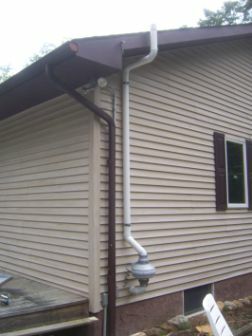 The piping then continues up the side of the house where it vents above the roof line. The piping only has to clear the lowest roof. 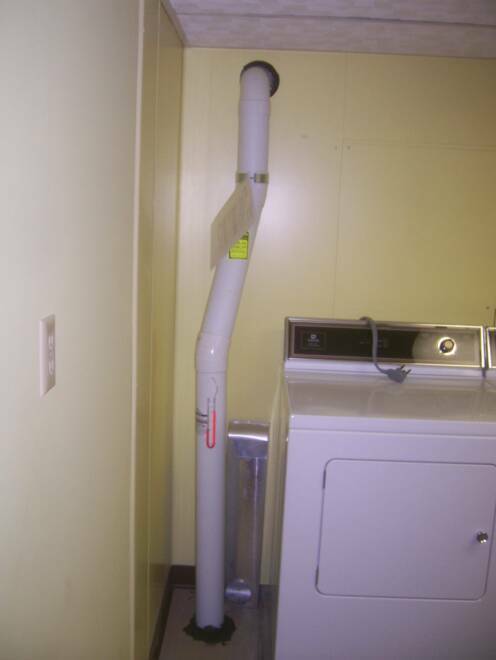 However, the exhaust point must be 2 feet higher than any opening (window,door,vent) that is within 10 feet. The fan may also be installed in the attic. 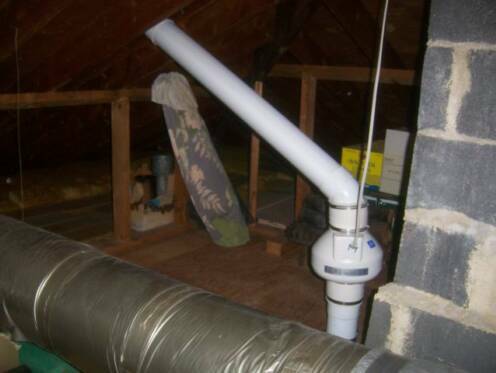 However, alot of times it is difficult to run the piping to the attic so most of the systems installed have the fans located outside. 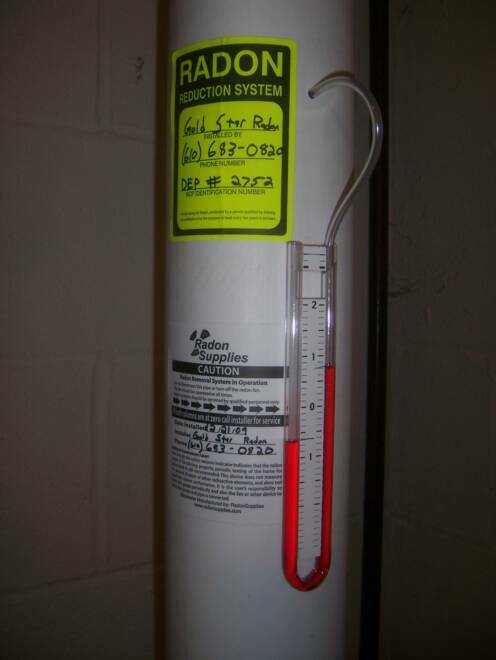 The biggest enemy of a radon system is water. Water causes the fans to burn out early. 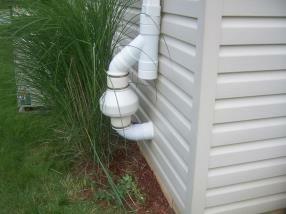 There is alot more condensation produced inside the pipe than rain water. 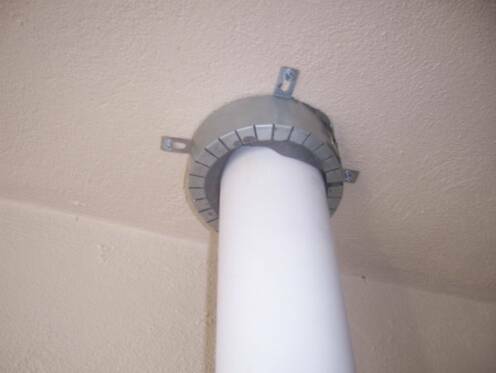 In order to prevent water from getting to our fans we install a 'Y' fitting to our outside fans. 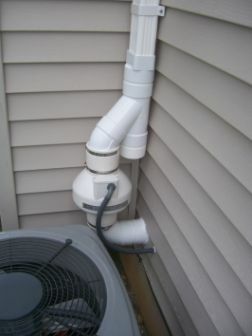 This allows any water in the pipe to drain out the bottom, while allowing the air to flow through the 'Y' and up the stack. 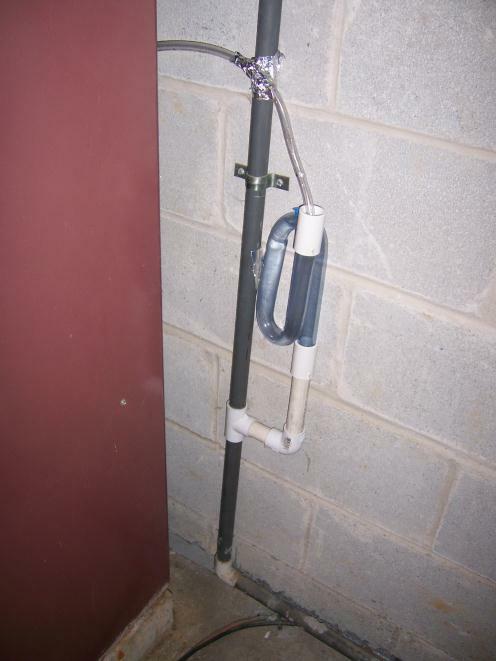 Sub-Membrane Depressurization System This is most typically used where there is a dirt floor. 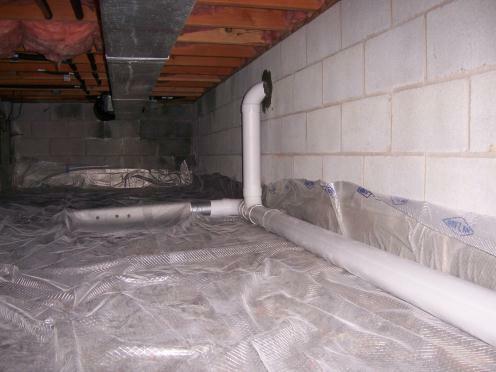 Usually in a crawl space, but sometimes the basement of a home as well. 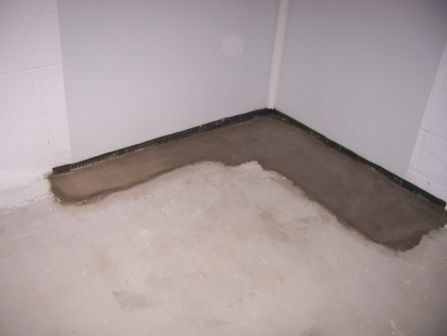 A membrane is placed on top of the dirt floor to mimic a regular concrete floor. 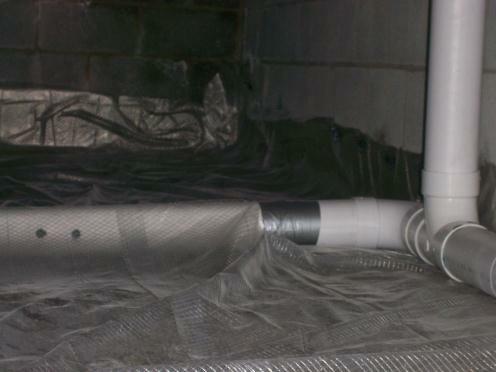 The membrane is sealed to the walls creating an airtight space underneath. 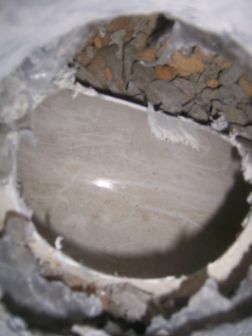 A pipe is then installed into the membrane just like in a standard Sub-Slab system. The membranes come in different strengths and is chosen based on how the homeowner uses the area. 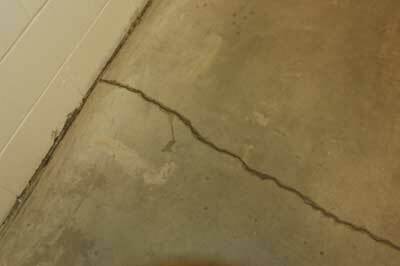 Along with sealing floor cracks and the sump pit, some homes contain perimeter or canal drains. 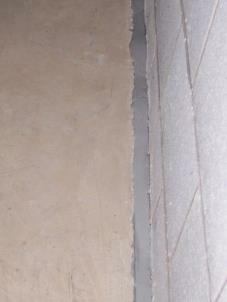 This is where there is about an inch gap between the concrete floor slab and the foundation wall. 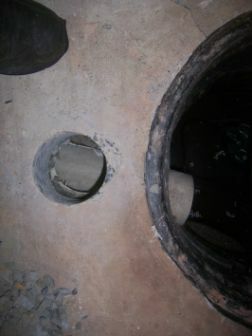 These drains often lead to a sump pit. In many cases this gap needs to be sealed. First a piece of backer rod (foam) is inserted into the gap. Next a layer of flowable caulk is poured over the top. 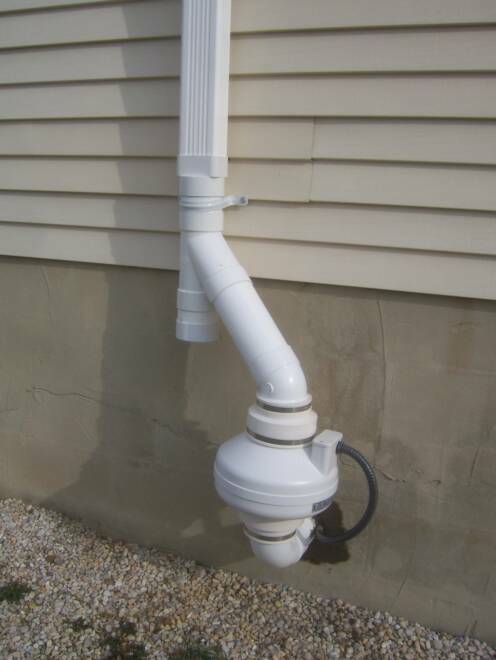 This creates an airtight seal which prevents the radon from coming up as well as holding the suction from the mitigation system down. 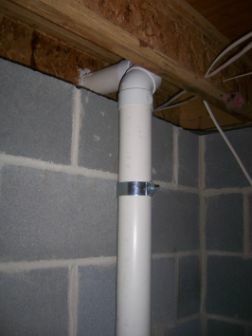 If this gap is not sealed many times the suction from the radon system will pull air from the basement as opposed to under the slab where it is desired.